Washington Jesuit Academy in Washington, D.C is among the first installations of the EcoFoot5D High Density 5-Degree Racking System. 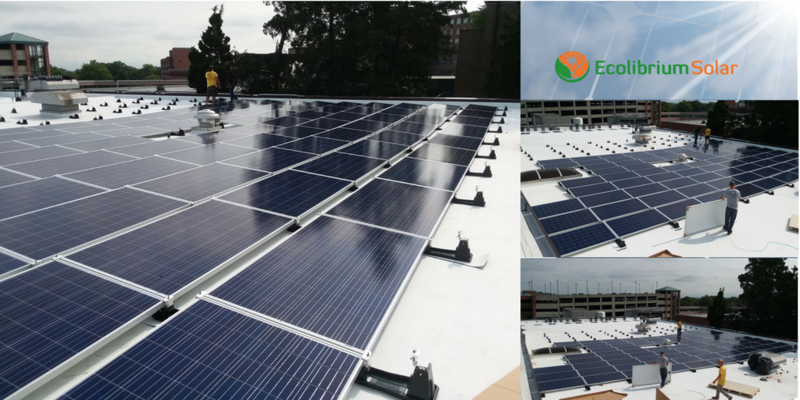 Installed by SolarGaines, the installation is 212kW. The project includes 664 solar panels in a landscape orientation. With tight inter-row spacing,EcoFoot5D fits more modules on the roof, while maintaining a fast, easy installation process. Ecolibrium Solar is providing onsite support. SolarGaines "strives to promote the use of solar power as agents of change in the way we power our lives." The installer serves serves Maryland, Northern VA, DC, PA & Delaware. To stay current on the latest news at Ecolibrium Solar, sign-up for our email list and follow us on LinkedIn, Facebook and Twitter.